Horse racing is a sport that probably started shortly after the first two horses met the first two humans. The Arabian is the oldest extant breed, and therefore, The Original Racehorse: it's remained virtually unchanged for 5,000 years. One benefit of the purity of Arabian breeding during these five millennia has been that contemporary Arabians look almost exactly as they did during the Bronze Age. Evidence of their popularity during that era can be seen on art objects from ancient Egypt and Mesopotamia, which now is known as Iraq.) These horses were used for both endurance races and, eventually, in chariot races sponsored by the Greeks and Romans. Fast-forward to the 17th and 18th centuries: English horse lovers had come to realize that, by breeding their mares with Arabians, they could create a brand-new breed of horse. A horse that incorporated all the wonderful attributes of the Arabian-loyalty, intelligence, stamina, endurance and the drive to run distances-with the muscular, slightly-taller stature of the native English horse breeds. Three men: Captain Robert Byerly, Thomas Darley and Lord Godolphin, bred their Arabian stallions (known respectively as the Byerly Turk, the Darley Arabian and the Godolphin Arabian)-and thus was born the Thoroughbred. And that new breed would become the second-fastest animal on Earth, second only to the Cheetah. It wasn't long before horse racing took hold across the Atlantic Ocean, in the New Land: the first recorded horse races in North America took place on Long Island, New York, in 1665. As more horses and more breeds poured into the continent, lovers of these breeds created racing platforms for their horses. Many varieties of horse now race in the United States: Arabians, Standardbreds, Thoroughbreds, Quarter Horses, Appaloosas and Paints have fans and regular race meets throughout the country. Thoroughbred racing was officially baptized in August of 1863, when the Saratoga Race Course was born, and with it, America's oldest continuous racing tradition. (The Saratoga Race Course is nation's oldest sporting venue of any kind, in fact.) The Saratoga Race Course celebrated its 150th birthday in 2013, a multi-month-long party, that featured scores of great events (many of them free)-created by the Saratoga150 committee. Horse racing in Saratoga comes in two forms: flat and harness. 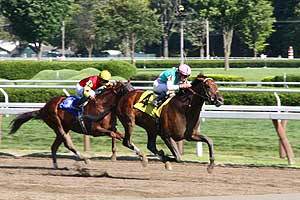 Flat racing is that which is done at the Saratoga Race Course: the horses run counter-clockwise on the large oval track-dirt or grass-with a jockey astride their backs. Harness racing is reminiscent of those beautiful Greek and Roman chariot races: Standardbred horses, attached to two-wheeled carts (sulkies) also race counter-clockwise, either pacing or trotting. From late July through Labor Day, horse racing fans have the opportunity to enjoy the best of both worlds-all racing, all the time. After a glorious, sunny day at the Saratoga Race Course, go to the Saratoga Casino Hotel, and experience a fabulous dinner at Fortune's in the Clubhouse. Fortune's has a brilliant chef: both their menu items and buffets are exquisite. And there are no bad seats at Fortune's: the 1/2 mile track is visible from every table in the venue. The decor is reminiscent of Cirque du Soleil: bright, jewel tones and contemporary (yet very comfortable) seating assure an evening that's a feast for the eyes, heart and gastronomy. The sport of horse racing has taken place for thousands of years, in thousands of places. Saratoga Springs is blessed to have deep, historic ties to the sport-perhaps more than any other location in the United States. Walking around grounds of both Saratoga race tracks, you can feel the spirits of the great horses, trainers and jockeys/drivers who grew the sport, and kept the action alive for us, and for posterity. This website, SaratogaRacetrack.com, aims to equip you to have the best time, ever, in Saratoga Springs, New York-and at the race tracks that bring so much joy to so many. We're working to provide you with the information you need-whether you're a first-time visitor or long-time friend. Peruse the 'site, and get details about the tracks, themselves, and suggestions of dining, lodging, attractions, and shopping options in the area. Think of our 'site as a toolkit, to help you design the perfect horse-racing-centered visit. You can get to know about the sport, the people, the horses and the Spa city. If you want to know about Saratoga horse racing, this is the place. Now, let's take a tour of saratogaracetrack.com, and see what interests you today, and whets your interest for July.